Mormons adhere strongly to the HOLY DAYS instituted by the law of God. They accept three sources of the law of God: (1) Bible, (2) Doctrine and Covenants, and (3) Book of the law of the Lord. The Doctrine and Covenants is a compilation of the laws given through Joseph Smith. The Book of the Law is a translation of a public copy of the law kept in the ark of the covenant; and brought out of Jerusalem six hundred years before Jesus. Mormons also observe events when God bestows a great blessing upon the people. April 6th is observed in remembrance of the organization of the Church of Christ on April 6, 1830, by Joseph Smith; according to the laws of man. July 8th is observed in remembrance of the establishment of dominion of the kingdom of God on the earth through James J. Strang on July 8, 1850 . The only Mormon people that I speak for are the followers of Joseph Smith and James J. Strang. James was martyred in 1856; and his murderers were protected by the state of Michigan. The saints were driven from the homes, their property stolen, and their families scattered. With no central leadership, the some individual members have fallen into honoring days neither established by God, nor honorable in His sight. FIRST. The Sabbath is the major Holy Day. Other Holy Days relate to special events and blessings by God. These are known as Feasts of the Lord and holy convocations. The Sabbath is a sign to the world of the people of God. Those who do not obey this law cannot be considered as being the people of God. “Not every one that saith unto me, Lord, Lord, shall enter into the kingdom of heaven; but he that doeth the will of my Father which is in heaven.” (Matt. 7:21) They honor the sun god of Nimrod, Babylon, Greece, Rome, and Constantine. They wear upon their foreheads the mark of the beast. James J. Strang claimed to have translated a copy of the Book of the Law of the Lord that was taken out of Jerusalem shortly before the Babylonian captivity. This was the most sacred book in all Scripture. It was considered too holy to fall into the hands of pagans; and all the copies of the book were destroyed. The Christian Bible fails to include this work; although it is noted over twenty times by name. A testimony of the truth of this book can be discovered in the chapter: The Ten Commandments. For whatever reason one of the Ten Commandments was deleted from the record in the Old Testament (Ex. 20:3; Deut. 5:7). The various sectarian Christian churches have divided the remaining nine to make ten. The Ten Commandments were still intact in the days of Jesus. “36 Master, which is the great commandment in the law? 37 Jesus said unto him, Thou shalt love the Lord thy God with all thy heart, and with all thy soul, and with all thy mind. 38 This is the first and great commandment. 39 And the second is like unto it, Thou shalt love thy neighbour as thyself. 40 On these two commandments hang all the law and the prophets.” (Matt. 22) Where is this second greatest commandment in sectarian Christian Decalogue? It is given as the fourth commandment of the Decalogue in the Book of the Law. The first three laws of the Ten Commandments are sins against God. The rest are sins against man; and as transgression of the law, are also sins against God. The first and greatest commandment was to love God and subject our will to His. The second law, in order, is the command not to usurp the authority of God. “Thou shalt not take the name of the LORD thy God in vain; for the LORD will not hold him guiltless that taketh his name in vain.” (Ex. 20:7) “And no man taketh this honour unto himself, but he that is called of God, as was Aaron.” (Heb. 5:4) The third law is to honor the Sabbath. SECOND. The second Holy Day commanded by God to be honored is the establishment of the dominion of the Kingdom of God on the earth in the last days. Adam, Noah, Moses, and Jesus were all first degree Kings. Moses was a first degree King with a dominion on the earth. James J. Strang was ordained a first degree King at the time he was ordained a first degree Apostle, Prophet, and Lawgiver on June 27, 1844. Like Jesus he held no dominion at that time. Ecclesiastical officers on Beaver Island were also civil officers. They were bound first to obey the law of God; and to obey the law of the land to the extent that it did not violate the law of God. The law reads, “The day [July 8] that James, the Prophet of God, was established King, and sat upon his throne, is a notable day; it shall be kept in remembrance forever. THIRD. The Feast of First Fruits was instituted by God; and a commission to observe this feast was given to Adam. The law of God required bringing the best of the first fruits. Abel offered the best of the firstlings of his flock. His offering was found acceptable before God. Cain offered an inferior offering of the fruit of the ground. Cain’s offering was not found acceptable before God. This inferior offering caused a change in the countenance of Cain, resulting in his killing Abel. “At every Temple where the name of the Lord your God is named, shall the Priest appoint the day of firstfruits, according to the days of your principal harvests of food; and by that day shall ye all bring your offering of firstfruits unto the Priest, in the Temple and the Synagogues, and ye shall have a holy convocation before the Lord in every place to which ye bring the firstfruits. James J. Strang noted that this feast is only required when the saints are gathered; and receive an inheritance. “Firstfruits are required of all who dwell upon the inheritance of the Saints.” It was observed under James J. Strang on Beaver Island until his death. FIFTH. At any time the Lord grants a great and choice blessing upon the people, they are bound to observe that event and teach their children to celebrate the same. “WHEN, in blessing, the Lord thy God shall bestow upon thee any great and choice blessing; or, in his abundant charity, shall deliver thee from any great calamity, thou shalt assemble together thy wives, and thy children; thy friends, and thy neighbours; and shalt celebrate his glorious goodness with thankofferings, and feasting, and musick, and dancing. The only days of this type, observed today, are the day that the Church of Christ was organized according to the law of man in the latter days and July 8th. On April 6, 1830 , Joseph Smith organized the Church of Christ (later known as the Church of the Latter Day Saints). This was a notable day; and most of the followers of Joseph Smith and James J. Strang celebrate this day. James J. Strang wrote of thanksgiving, “1. There is a natural buoyancy of spirits in the constitution of man, which will not live down to the demands of misanthropy. It is the native thankfulness of the heart, for blessings bestowed, favors conferred, and happiness enjoyed. The traditions of the Jews were anchored in direct association with the true and living God. Nimrod, a grandson of Noah, was the father of idolatry. He developed a system of worship that was directly contrary to that of God. These doctrines and celebrations were handed down through Greece and Rome directly into the Christian Church; when Constantine in the early fourth century amalgamated paganism with Christianity. The former gods of paganism were still honored; but, they were given Christian names. The festivals of paganism were adopted directly into Christianity with only the names changed. CHRISTMAS. Christ Mass was established by the Catholic Church as a Sacrament for the observance of the birthday of Jesus. No encyclopedia will fail to note that Dec. 25, was a pagan holiday; and had no association with Christianity. Anyone can observe in Rome on Dec. 26 that the days are truly becoming longer. The sun is born again. No Biblical scholar will give any weight to Dec. 25, being the birth day of Jesus. The best conclusions they are able to make is that Jesus was most likely born in the Spring. The celebration of Dec. 25, as the birth day of Jesus, was an adoption of the pagan festival of the same date. One can only imagine the difficulty in converting pagans; and taking away their most beloved celebrations. It was much easier for the Catholic Church simply to adopt the pagan celebration; and give it a Christian name. Consider the source. This scattered condition of the people, the loss of Apostles and Prophets, and the tendency of man to drift from the simple worship of pure Christianity has caused some to adopt pagan practices celebrated by their Christian neighbors. True Mormons do not accept Christmas as the birth day of Jesus. As most do not have to work on that day, many use it as a day for family celebration and thanksgiving; even as Jesus used the “venerable day of the sun,” when most were not required to work, as a day for holy convocation. It is not the day that is evil; but, the honor bestowed upon it. Jesus, the Apostles, and the early Christians always honored the seventh day Sabbath. Dec. 25 is not the birth day of Jesus. Honoring it is honoring its pagan origin. It may be another mark of the beast—a departure from pure Christianity to paganism. The knowledge of the relationship of the Christmas tree with the birth of the son of the Mother of Heaven seems to have been entirely lost. The simple use of a tree, and the exchanging of gifts, can add happiness to a family gathering. With the symbolism of mysticism gone, many Mormons simply celebrate the day like another Thanksgiving. EASTER. Easter was a direct adaptation from paganism. Nimrod, King of Babylon, had done his work well. For fifteen hundred years the pagans had celebrated this spring festival. They could not give up the spring rites anymore than they could give up the winter rites. Again, consider the source. True Mormons do not celebrate Easter; as it bears the very name of idolatry upon its forehead. Easter was translated from Astarte—the pagan queen of heaven. Like Christmas, it is most likely another mark of the beast. The resurrection of Jesus is the central theme of Christianity not the crucifixion. Mormons offer great honor to this event; but, they do not celebrate it on Easter. Many Mormons combine the celebration of the resurrection with the celebration of the establishment of the Church of Christ on April 6, 1830 . Saint Valentine’s Day. Although this day was solemnized by the Catholic Church, to the extent that it is used for good and love, Mormons often observe this day. It is only observed as a thanksgiving to God for the blessings of love that we enjoy; and a special moment for the sharing of our love with our family and friends. It is becoming another commercialized day, like many other gentile holidays. Love is a blessing that should be shared on every day throughout the year; and not just on a single day. A healthy dose of daily affection will cure many of man’s infirmities. We should make every day special. The law of God is founded on love. Saint Patrick’s Day. This is another holiday solemnized by the Catholic Church. For those of Irish descent, it would not seem objectionable to remember the day as a celebration of the blessings of that homeland. Mormons do not keep it as a day for drinking and rowdy parties. Holidays fall into two categories. The first type is those that were discussed above. These have roots in religious events. The second is those with roots in the traditions of man. Each must be considered in its own context. New Year’s. This day has been celebrated among Mormons to keep in remembrance all the blessings they have received from God throughout the preceding year. They are not to become involved in the drunken parties and rowdy activities often associated with it. It is a time of joy to praise God and offer thanksgiving for all the good things that enjoyed during the year. It is also a time to greet the New Year and to offer up our prayers for those things which are proper and edifying, that we cannot provide for ourselves. Thanksgiving. Mormons honor Thanksgiving as a day to unite their families and offer their thanks to God for all the blessings they have received. This is the only National Holiday that deserves the celebration of Mormons; even though they received some of the worst persecution of any people on this presumed land of the free. Thanksgiving is a daily Mormon activity; but, and they enjoy have honoring it with their neighbors. National Holidays. Mormons should do not honor holidays established by any government of man. Every government is a usurpation of the authority of God; as none claim to have received authority from God. Most do not even believe in revelation. God established a perfect government; and gave them divine authority to act according to their offices. It was called a Theocracy; as officers held both civil and religious authority. Their directions came from the throne of grace. One such King was called Moses. Their laws were the laws of God. All governments of man will fall when Jesus returns. Many of the ideals of our founding fathers have been lost in the greed of politics, money, and power. The History Channel broadcast a series called “The Men Who Killed President Kennedy.” Their findings were nearly as dreadful as the killing of the Mormons. Through their research they concluded that President Kennedy was likely assassinated by Lyndon B. Johnson. It appears that both state and federal agencies combined to execute the killing and the cover up. It was noted that the government will never be same; after being infiltrated with such evil powers. What we see and are told is not always the real story. The rights that were supposed to be granted to the Mormons with this independence and freedom, though, were consistently denied. They were treated as though they were foreigners in their own land. They were refused the right to equal justice and protection from criminal acts done upon them. After being persecuted in Kirtland, Ohio, they settled in Independence, Missouri. The Governor of the State of Missouri actually issued an extermination order to either kill, or drive the Mormons from the state. The Governor had been party to many mob activities. They were not driven for violating any laws; but because their religious doctrines were intolerant of the wild abuses of civil law present in the wild mobs of Missouri. Religious discrimination, administered by the state, caused them to be murdered, scattered, and driven from their homes, without provisions, in the middle of winter. Their blood stains remain on the soil of Missouri . When they petitioned the national government for protection, under the law, they were ignored. They found refuge in Nauvoo, Illinois south of St. Louis. Their industrious nature led to the establishment of the largest city of that time. But, after building up this flourishing city and neighboring towns, religious prejudice, political interests, and commercial rivalry combined to destroy them. With the help of the Governor of the State of Illinois , Joseph Smith and his brother Hyrum were murdered; while under the pretended protective custody of the state. Their houses and property were burned and an entire community, amounting to 25,000, was banished from the state. How can anyone honor a nation that combines to murder and injure its citizens; and deprive them of equal justice under the law? 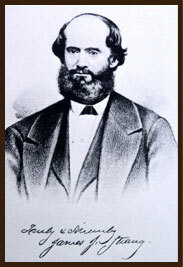 After the murder of Joseph, James J. Strang was called of God to stand at the head of the people. They first settled near Burlington, Wisconsin; and later on Beaver Island, in upper Lake Michigan. Again, they encountered the same religious discrimination that had followed them from Kirtland, Independence, and Nauvoo. Again, on April 6, 1850, the Mormons pleaded to the President, Congress, and people of this nation for religious freedom and equal protection under the law. Again, they were ignored. The citizens of Mackinac were among the lowest order of morality among a Christian people; and became set upon the destruction of the Mormons. The Mormons prevented many of them from selling cheap Indian whiskey; which caused the Native Americans tremendous injury. 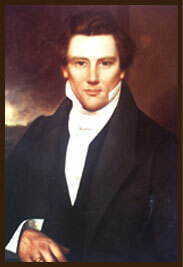 James J. Strang, in one of the last issues of the church paper on Beaver Island before his assassination, wrote, “The 6th day of April, 1830, the Church of Jesus Christ of Latter Day Saints was organized at the town of Fayette, in the State of New York, consisting of only six members, two of whom, Joseph Smith and Oliver Cowdery, were Elders; being the only true and living Church existing by the commandment of God on earth. Almost immediately after the organization of the Church, the Saints commenced assembling at Kirtland, Ohio, for a temporary rendezvous; but at the same time a few went up to Missouri, to locate a permanent residence, and selected the site of Independence, Jackson county, as their future home, and commenced a settlement there. Agreeable to a commandment which God gave them, they purchased large quantities of lands of the government of the United States , and paid the full price therefore to the officers of the United States , the ministers of your predecessors in office. Upon these lands our breth­ren, the saints, made extensive settlements, continually showing themselves the most indus­trious, peaceable and law-abiding citizens of that section of the country. At the time of which we speak no one among them was accused of any violation of the law, or of a want of at­tachment to the constitution and government of the United States , or of the state of Missouri . Notwithstanding these facts, and the legal rights of our brethren, a numerous meeting of cit­izens of Missouri was held at Independence , in Missouri , which decreed the expulsion of the saints from that part of the State. This meeting issued a manifesto to the public, giving to the world the reasons for banishing from their neighborhood a numerous class of citizens; the entire church of the Latter Day Saints. In giving these reasons they stated that our religious senti­ments and domestic habits were incongruous with theirs, and that it was necessary for their happiness that our brethren should leave; and as the grievances of which they complained were not recognized by the laws, and the saints had not violated any existing law whereby they were subject to regular prosecution in the courts, therefore they would take redress into their own hands, and compel us to leave the country, peaceably if they could, forcibly if they must. * This decree was carried out by the expulsion of the saints from Jackson Co., Missouri. *The western Monitor, of 2d August, 1833 , contains this manifesto. We extract from it the following: “The evil is one that no one could have foreseen, and is therefore unprovided for by the laws, and the delays incident to legislation, would put the mischief beyond remedy. “it requires no gift of prophecy to tell that the day is not far distant when the civil government of the country will be in their hands. When the sheriff, the justices, and the county judges will be Mormons, or persons wishing to court their favor from motives of interest or ambition. “That no Mormon shall in future move and settle in this county. “That those now here, who shall give a definite pledge of their intention within a reasonable time to remove out of the county, shall be allowed to remain unmolested until they have sufficient time to sell their property and close their business without any material sacrifice. “That the editor of the `Star’ be required forthwith to close his office, and discontinue the business of printing in this county; and as to all other stores and shops belonging to the sect, their owners must in every case strictly comply with the terms of the second article of this declaration, and upon failure, prompt and efficient measures will be taken to close the same. “That the Mormon leaders here, are required to use their influence in preventing any further emigration of their distant brethren to this county, and to counsel and advise their brethren here to comply with the above requisitions. “That those who fail to comply with these requisitions, be referred to those of their brethren who have the gifts of divination, and of unknown tongues, to inform them of the lot that awaits them. After adopting this manifesto a committee was sent to exact a pledge of compliance from the Mormons, and on their refusing to give it, “It was unanimously resolved by the meeting, that the `Star’ printing office should be razed to the ground, the type and press secured,” which was immediately done. They then settled in various counties on the north side of the Missouri river, but continual collisions took place, till finally they were banished from the State by authority of a mandate guilty issued by Lillburn W. Boggs, acting Governor, distinctly commanding that the saints (in de­rision called Mormons) be banished from the State, or exterminated. We are perfectly aware that this mandate of the acting Governor was unauthorized by the law, and in violation of the constitution of the State of Missouri . But the Legislature of that State, in failing to impeach the Governor, and by appropriating the money to pay the expense of executing his order, has affirmed and adopted the act as the crime of the State. In accomplishing this expulsion ten thousand persons,, men, women and children, were plundered of their possessions, exiled from their homes, and driven in destitution, hunger, and want, in mid winter, to a distant land, passing much of the way in the midst of hostile foes, who not only refused them shelter and food, but kept them in continual danger. Many were separated from their families and incarcerated in prison, whence, after long deten­tion, they escaped only by paying large sums of money to prison keepers, judges and lawyers, as the price of their enlargement. Besides a feeble few, who, after learning that their perse­cutors were without compassion, were slain while defending their wives, their children and their firesides; eighteen persons, unarmed, and engaged in the worship of God, were murder­ed unresisting, and in cold blood, in the early part of these persecutions; one of them a mere child, who died mixing together the words of his prayer to God, and his supplication for mer­cy from his murderers; another, an old man, bowed down with suffering and sorrow, scarred with the wounds he had received fifty-seven years before in defense of American liberty and American independence; all yielding up their lives for the name of Jesus, and the witness of the gospel. Others, at different times, shared the same fate; how many, we know not. Subsequently the saints settled in great numbers in the State of Illinois, and built up, besides many villages, the city of Nauvoo, at one time the most populous city in that State. At their first settlement they were kindly received; but after building up flourishing towns, be­coming numerous as a religious people, and strong in their political influence, religious prejudice, political interests and commercial rivalry combined together to destroy them. On this occasion our persecutors sought to justify their violence by accusing the saints of enormous crimes, and the most astounding corruptions. That these accusations were utterly unfounded is clearly shown by the fact that with courts, jurors and prosecuting officers con­stantly and assiduously selected from among our persecutors, few of the saints were ever pros­ecuted on criminal charges, and very few indeed ever convicted. That the best informed and most intelligent men of the nation are fully aware of their entire innocence, is shown in the fact that territorial government has been organized under an act of Congress, possessing as full powers as any other territorial government can, organized under the jurisdiction of the United States; giving its entire executive and legislative power to the same people then exiled; and the men among them who exercised most influence and control in their affairs, and who if they were criminal were most guilty, have received the offices of Governor, Marshall and Secretary of a Territory, as well as numerous minor appointments under the United States government both Whig and Democratic administrations. The very high character given them by Senator Douglass who presided over the criminal courts of the Mormon District of Illinois, during the period of their sojourn there; by Col. Kane of the United States army; who witnessed their expulsion; and Captains Stansbury and Gunnison, of the Topographical Engineers, who spent a year with a large body of them in their new mountain home, have dissipated all suspicion in the minds of intelligent men that they had given any occasion for the harsh treatment which they received at the hands of the people of the State of Illinois. The unequivocal testimony of Thos. Ford, Governor of Illinois, at the time of their expulsion, who was present most of the time at the scene of action, is that their character and conduct were far better than those arrayed against them. Nevertheless this persecution was carried on until our fellow servants, the prophets, Joseph and Hyrum Smith, were martyred; the houses of hundreds of the saints burned down before their eyes; the entire community amounting to 25,000 banished from that section of the State, and four millions of dollars worth of property sacrificed. After the banishment of the Saints from Illinois, a few of them came into Michigan, and commenced settlements on the Islands of the Great Lakes, then uninhabited, but occasionally occupied by roving borderers, engaged in fishing and selling liquor to the Indians, in violation of law, and in criminal courses still more reprehensible. The attempt to build up permanent and populous communities in the midst of these valuable lake fisheries, especially at Beaver Island, where there is an excellent harbor, and every facility for an extensive and prosperous commerce, excited the jealousy of those who at Mackinac had for a long time monopolized the entire Indian and fishing trade. The wretched men of the borderers who had sought a home beyond the haunts of civilization, that they might indulge in unrestrained debauchery and enjoy impunity in crime, could only regard settlers who sought good order and legal government as invaders and enemies. They early exhibited a hostile disposition, and a determination to prevent the establishment of legal government. As early as 1849 we were subjected to numerous injuries, for which it was impossible to obtain redress. Women were insulted, and men assaulted with impunity. At the same time a concerted effort was made throughout the lake country to render us infamous, by telling false tales upon us. The numerous whiskey dealers on the fishing grounds, whose entire income was derived through criminal means, joined by most of the merchants at Mackinac, who were most seriously alarmed at the growing up of a commercial rival at Saint James, engaged in the undertaking and enlisted the officers and men on nearly all the boats and vessels in the upper lake trade, by means of their acquaintance with them. Every manner of false tale was thus continually put afloat, and no matter by what falsehood originated, was circulated through respectable newspapers, on what was taken for good authority. By such means, in a short time the mass of the public were persuaded that the Saints at Beaver Island were the offscourings of all things, and the dregs of the inhabitants of the earth. Under these circumstances, with no means of becoming generally known to the public, except through the representations of those thoroughly enlisted against us, in 1850, extensive preparations were made throughout the fishing region for an armed assault upon us, by a force more than four times as numerous as we could furnish for defense. The Saints were thoroughly schooled in the practice of nonresistance, and were unarmed. But by the prophecies and commandments, it appeared that having three times fled before their persecutors, it was now our duty to withstand them, and that in doing so God would give us the victory. We resolved to repel force with force, and return blow for blow, and stroke for stroke, publicly announced one determination and prepared for the issue; and our enemies gave way without bloodshed. In 1851 they succeeded in enlisting the United States government in a violent and lawless crusade against us, in the course of which immense quantities of private property was seized, and taken from us; numerous individuals were arrested on charge of felonies and misdemeanor of almost every manner, and carried prejudged and foredoomed, to distant places for trial, in the courts of their enemies; the United States military and naval force was put in requisition to awe our families in the absence of nearly all the men, while numerous armed bands of our persecutors were left to roam undisturbed through our settlements, taking and destroying what they pleased, and insulting and assaulting when they would. From all these perils God delivered us. Every one of the accused were acquitted. Though numerous persons were assaulted and cruelly beaten, every one recovered. Only a small portion of the property which had been taken from us was ever restored; but the justice of our cause was vindicated by the decision of the proper officers that we were entitled to all of it, and the actual loss was by the outright stealing of public officers. While these acts were going on, a few people from Mackinac, and a numerous horde of border ruffians, sometimes under pretence of legal process, but oftenest by mere force of arms, seized nearly all the movables of value possessed by our population. For these acts we pursued many of them at law to final judgment, who have abundance of executable property, but in very few of these cases have we been allowed to make collections on executions. This persecution resulted in separating our enemies from among us, and leaving us the undisturbed occupancy of a territory sufficient for our use for many years to come; and at the next session of the Legislature acts were passed for establishing the necessary municipal authorities in that territory, organizing town and county government, and a regular judiciary. Irritated at this, and suffering a great loss of trade by our growing prosperity, the people of Mackinac set on foot an armed invasion, for the avowed purpose of resisting all legal government in the county of Emmet , a purpose not concealed, but declared in the resolutions of their public meetings, and published in the newspapers. A conflict ensued in which several of the Saints were wounded, and several thousand dollars of property destroyed; but the invasion failed, and the invaders fled as the wicked often do, when no man pursued. The criminals engaged in this invasion were duly indicted, but by the connivance of officers and citizens they were able to escape a trial and have gone unpunished. But their flight from this region left us in the enjoyment of peace and undisturbed order. But the action of the State Legislature, at its next session in cutting up the county of Emmet , legislating its officers out of office, and denying a judiciary to the new county of Manitue , indicated a settled determination to deny us legal protection, and secure from punishment those who had committed crimes against us. For all these wrongs the laws and institutions of the country offer us no redress. It is vain to answer that such acts are contrary to law, and that the courts are open to us. There is a law in the land stronger than statutes–more potent than the usages of courts. The will of the masses, however vicious and partial, no matter by what influences produced, has been able to trample on all precedent, and ride down all law. It has done more. It has produced legislation according to its wishes, in violation of all constitutional securities; and not merely contrary to precedent, but destructive of natural right. This unrecognized law, found only in the will of the masses, has been enforced in destroy­ing houses, offices and valuable papers of some of the most distinguished citizens of the coun­try, public buildings of various kinds, printing presses and rail roads owned by wealthy com­panies, churches and convents of the most ancient and numerous religious denomination in the country, and to overthrow contracts which had stood the vicissitudes of two hundred years, the ordeal of civil war and national revolution, though defended by the sanctity of constitution­al and statute law; usages older than the language we speak; the power of a great State; the wealth that seven generations of thrift had accumulated; and backed by an aristocracy made honorable by deeds of benevolence, justice, patriotism and valor as boundless as the sources of its greatness. If these cannot resist the power of this new element of national and state government mob law, how shall we? We are aware that our name is cast out as evil, as a kind of apology for the uncounted injuries which have been heaped upon us. But you will not forget that in ear­ly times among all the most polished nations the name christian was looked on as a name for fanaticism and debauchery; that the learned Greeks and victorious Romans held them canni­bals, and that, even now, in half the civilized and christian nations democracy is considered synonymous with anarchy and lawlessness–how justly, you can judge. And if the sanctity of the ancient Christian faith, and the greatness of your nation have not protected them from these aspersions, what shall protect us from equal wrongs? We protest against this nearly universal practice of assuming that we are guilty of great crimes, as an ex­cuse for denying us the regular protection of the government in our legal rights. But when we examine the evidence of the truth of these assumptions, they are most conclusively falsified. Joseph, the martyred prophet, whose blood stains on the jail at Carthage are as indelible as those of Jesus on the cross, has been arrested thirty-nine times on criminal charges. Thirty nine times he has been tried in the courts of his enemies; many times at the bar of men who advocated his murder. And thirty-eight times, in such courts, at the bar of such men, has he been acquitted. The only offence of which he was ever convicted is that of unlawful banking–an offence committed with impunity by other men in nearly every State in the union. Nor did he es­cape conviction by the testimony of his brethren. Such men would stop their ears against it. If this is not a sufficient vindication of him as a law-abiding man, no array of facts could be. That the charge on which he was finally arrested and imprisoned was merely trumped up for the purpose of seizing upon him and detaining him till a convenient time for his destruction, is as clearly proved as any fact whatever in the history of the country. And when we add that his murderers were indicted, arraigned and acquitted at the instance of their own friends, without any attempt to introduce the necessary evidence against them, and merely for the purpose of interposing a legal bar to their punishment, in some more healthy period of the public mind, we think it will not require argument to convince all mankind that, the State of Illinois has adopted that murder as its own. In this place, during the persecutions of 1851, ninety-nine men were arrested on false charges, taken to distant places and tried in the courts of their accusers, and though prejudged and foredoomed, were every one of them acquitted. For all these wrongs we are denied redress. We have not forgotten that there are tribunals in which causes partially similar in kind, immeasurably less in aggravation, are sometimes examined, perhaps occasionally righted. But these tribunals are closed against us by the law now, and at all times by the power of that law already referred to, which is above statute, precedent and right. If a period cannot be put to these wrongs, then there is presented to the world the melancholy spectacle of the greatest republic on earth, a Christian nation, acknowledging itself powerless to judge; unable to protect the right; a nation on whose righteousness half the earth rest the hopes of man, confessing that there is a power above the law, riding down the constitution, which stalks abroad to plunder and banish the citizens, and none to rebuke; murders the unoffending innocent, and none to say, “why do ye so?” which sancti­fies its deeds of violence, even in the eyes of religious men, by blackening the fame of the glorious dead, with the name of crimes which in their life time it dared not attempt to prove, even in its own tribunals. The administrators of the government have been appealed to in vain. Unless the wrongs redressed, they must rest on the nation forever, and bring down the wrath of God on those who have done, and those who have permitted them? If you fear not God, how will you answer to man­kind and to posterity, for such a desecration of republicanism, in a Christian country. For all these wrongs we do not ask a grant of lands, nor a State or Territorial government–We acknowledge that we have had enough of these. We shall never sell the lands of our brethren and ourselves, the inheritance of the martyred and of their children, for new grants of which we are equally liable to be deprived by some new act of violence. There is now in the States of Missouri and Illinois four millions of dollars worth of houses and lands purchased with the money and produced with the skill and industry of our brethren the saints, which they are not permitted to occupy. Courts, State Legislatures, and State executives are deaf to us. When we speak, they cannot hear. When we ask justice, their faces are turned from us. True, when they do speak, their voice is for us. But it comes after the deed is done, or it is so faintly heard that the lawless do not think it earnest. The forms of law hold us as victims, and the power that is above law overwhelms us. Thus have two of our prophets died in the hands of public officers, and under the destroying protection of a State Governor, personally superintending the proceedings, and no one act of public indignation has rebuked the deed. By every form of .judicial proceeding known to the laws of the land, the perpetrators have been legally shielded from the punishment which the law itself denounces against such crimes. The fact that our brethren are the owners of large tracts of land, purchased of the United States, and secured to us by the name and seat of the President, which they have never sold, and which they are not permitted to occupy, by the powers actually existing, and that our brethren have been banished and murdered, and their persecutors are un-rebuked, and positively and legally screened from punishment, is as indelibly stamped on the history of the country as the declaration of independence, or the victory of Buena Vista. We do not ask compensation in money or land for the blood of the dead, or the persecutions of the living. The lands we have been robbed of, we shall continue to claim for the banished, and for the widows and orphans that murders have made, till the day when the judgment of God shall be revealed on the nation, and his wrath no longer slumbers; and they shall go up and possess it, though the nation ceases. But these things admonish us that we are not to expect peace or protection in the midst of the people who have done us this iniquity. Both by the commandment of God and from the necessity of our situation, we are seeking a home in a land where religious sects and political parties are far removed from us, a land uninhabited. We have not been suffered to live with other men. Shall we not be permitted to live alone? God made the earth for all men. Of the vast all he has given us a few little islands. They are the work of his hands; not man’s. Why should man sell God’s work? For nine years our communities have dwelt here in peace among themselves. The few small schisms which have arisen, have yielded to the ordinary course of discipline, and the wrong doers have either amended or departed from among us, doing us very little injury, except as they were abetted by public officers, religious boobies, the newspaper press, and bands of lawless men. Yet we are pursued from day to day with continual threatening. An effort is continually made to convince us that we are to have no rest forever. Three times have we fled before our persecutors, because we would not repel injuries by force. We understand by the word of God that it is our duty to flee no further. We do not learn from the divine writings that it is our duty never to resist evil deeds.—The time has come when forbearance is no longer a virtue. While men around us have for years threatened us with fire and blood, and we only asked legal justice, they have been continually commended for the forbearance, and we continually menaced with invasions, expatiation and death. We have ceased to take to ourselves any trouble about these matters. We have known for years what our persecutors seem so anxious to impress upon us, that, when the public vengeance is waked up the law will not protect us and that among an angry people innocence is no shield. We do not expect Governor or President to protect us against mobs. We live in the continual assurance that any one of us might be murdered in a neighboring county, and not a magistrate could be induced to issue process against the murderer. Yet we trust in God. We walk in conscious security. We laugh in bitter scorn at all these threats. And we tell these wolf hounds, marshal your myrmidons, and send them along, to make a spoil of beauty and booty, as soon as you please. We bid them a bloody welcome to hospitable graves; over which, each year, we will pile stones, with a muttered curse, against the day of the resurrection of damnation. We will neither purchase temporary peace and future calamities by dishonorable trafficking with political jugglers, nor will we yield our homes to enemies. If we live, here will we live. If we die, here will we die, and here shall our bones be buried, expecting in the resurrection of the just to possess the land forever, and dwell with the righteous during the lifetime of the Eternal. God judge between us and all men. Saint James, June 1, ’56 .